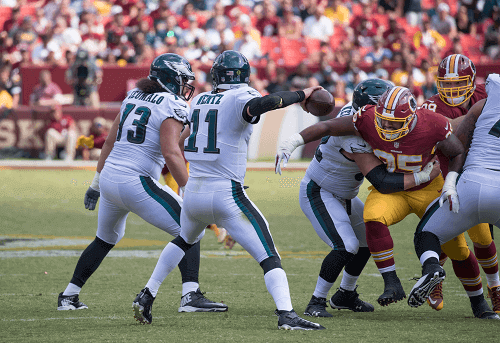 The NFL’s National Football Conference (NFC) East division is made up with some of the most notable names within the sport: the Dallas Cowboys, New York Giants, Philadelphia Eagles and the Washington Redskins. Although these massive teams are known for paying massive salaries and signing the biggest names to ever pick up a football, this doesn’t always translate into Super Bowl wins. Below we have a look at the form and odds of the teams within this hugely popular division. Philadelphia Eagles – it is not often that a team is able to get back to back Superbowl wins, but the Eagles should never be counted of the game. Despite some troubling times before their 2018 Super Bowl win, the Eagles have come into great form. Doug Pederson’s changes to the roster seem to have done the trick as more often than not the Eagles seem to be winning. Dallas Cowboys – the Cowboys have been looking to win their first Superbowl since 1995 for some time and it seems that this win may come sometime soon. While many may peg the team to be the plucky underdog, they’ve had a rather strong showing in some games thus far in 2018 and may have what it takes to go all the way. New York Giants – the New York Giants last won the Super Bowl in 2012, but since then, they have had a rather poor showing. The team ended the 2017 season with an absolutely terrible score of 3-13. Despite several management changes, the Giants don’t seem as if they’re going to be winning any Super Bowls any time soon. Washington Redskins – the Redskins last won a Super Bowl in 1991 and have not made it to the playoffs regularly since then. Despite the team having a rather even showing in 2018, it is unlikely that they will make it to the Super Bowl this year. Thus, many sport books have given the team rather terrible odds of winning football’s biggest trophy. When making any sort of sports bet, it is important to look at the current form of the team you would like to bet on. Currently, it does not seem that any of teams within the NFC East really have what it takes to win the Super Bowl, but then again, no team should ever really be counted out. In 2012, the New York Giants ended the regular season with a record of 9-7 and later went on to beat a New England Patriots side led by Tom Brady and Bill Belichick to take home the Vince Lombardi trophy. So, anything can happen really.